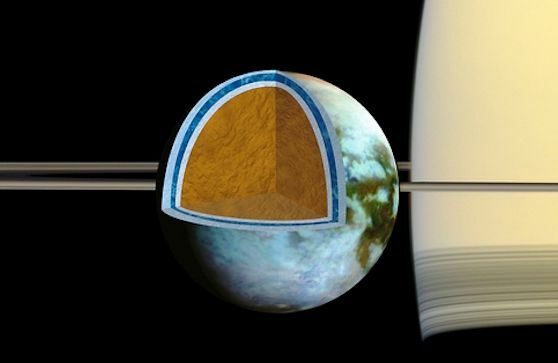 July 2, 2014: Scientists analyzing data from NASA’s Cassini mission have firm evidence of an ocean inside Saturn's largest moon, Titan, which might be as salty as the Earth's Dead Sea. The findings are published in this week’s edition of the journal Icarus. "This is an extremely salty ocean by Earth standards," said the paper's lead author, Giuseppe Mitri of the University of Nantes in France. "Knowing this may change the way we view this ocean as a possible abode for present-day life, but conditions might have been very different there in the past." The new results come from a study of gravity and topography data collected during Cassini's repeated flybys of Titan during the past 10 years. Researchers found that a relatively high density was required for Titan's subsurface ocean in order to explain the gravity data. This indicates the ocean is probably an extremely salty brine of water mixed with dissolved salts likely composed of sulfur, sodium and potassium. The density indicated for this brine would give the ocean a salt content roughly equal to the saltiest bodies of water on Earth. Their findings also support the idea that the moon's icy shell is rigid and in the process of freezing solid. The thickness of Titan's ice crust appears to vary slightly from place to place. The researchers said this can best be explained if the moon's outer shell is stiff, as would be the case if the ocean were slowly crystalizing, and turning to ice. Otherwise, the moon's shape would tend to even itself out over time, like warm candle wax. This freezing process would have important implications for the habitability of Titan's ocean, as it would limit the ability of materials to exchange between the surface and the ocean. The data also touch on a major mystery: The presence of methane in Titan's atmosphere. Scientists have long known that Titan's atmosphere contains methane, ethane, acetylene and many other hydrocarbon compounds. But sunlight irreversibly destroys methane after tens of millions of years, so something has replenished methane in Titan's thick air during the moon's 4.5 billion-year history. The rigid ice shell model published in Icarus suggests that any outgassing of methane into Titan's atmosphere must happen at scattered "hot spots" (like the hot spot on Earth that gave rise to the Hawaiian Island chain), not from a broader process such as convection or plate tectonics. "Titan continues to prove itself as an endlessly fascinating world," said Linda Spilker, Cassini project scientist at NASA's Jet Propulsion Laboratory (JPL) in Pasadena, California, who was not involved in the study. "With our long-lived Cassini spacecraft, we’re unlocking new mysteries as fast as we solve old ones." The Cassini-Huygens mission is a cooperative project of NASA, the European Space Agency and the Italian Space Agency. JPL manages the mission for NASA's Science Mission Directorate in Washington.